Kate came to us as she was putting the final touches on her new book. She needed creative direction on her book, brand, and website. As an author it was very important that Kate was able to sell her books through her website, have a place to keep writing, and make sure her fans could stay up to date with her events. We provided the inspiration and creative direction you will see with her on-line presence. 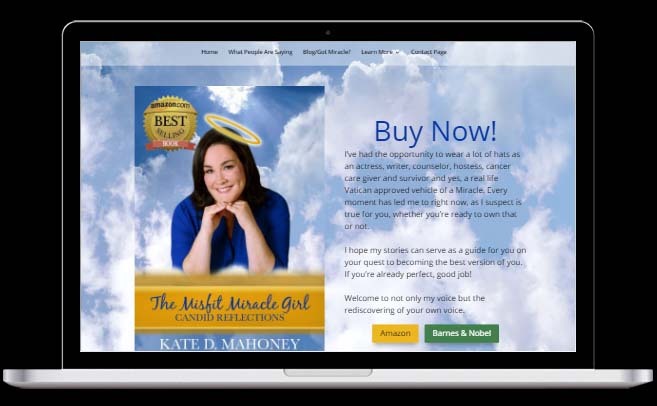 We crafted Kate a website that put the sale of her books first and then social feeds and a blog so that she can keep in touch with her audience. During this project, with our creative direction Kate rested on the book title “Misfit Miracle Girl”. 🙂 Then went on to become a best selling author. I was excited right out of the gate to know that I would have the support and skills of someone like Zac who knew how to do something that was completely foreign to me. The nerves and the doubt that accompany most writers were an equal part of the package, but I appreciated that Zac was patient, willing to teach me, work for me and at ultimately create something that would both be proud to put our names on. I am not tech savvy. In fact, on a sliding scale of butter churn to web design I am happily churning away. Each time I talked to Zac he would walk me through the steps of a particular program or process I didn’t understand. I was not just glad to be learning without being judged but put at ease knowing that even though I didn’t know exactly what was happening, Zac did, and he took the time to explain things – sometimes a lot more than once – because he valued me as a client. There was comfort in knowing we could work independently of one another, honing our individual crafts and come together to respectfully work through things collaboratively and create the brand we wanted to share with the world.